Lucky for you this smiling Paper Plate Leprechaun is easy and fun to make. The kids will enjoy making this craft project to hang on the bulletin board or the fridge at home. Construction paper scraps in blue, white, black, pink, and yellow. Begin the paper plate leprechaun by making the hat. Cut a square from the green paper, the size you would like the hat to be. 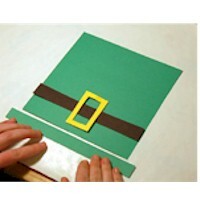 Next, cut a thin rectangular strip of green construction paper for the brim of the hat. Make this a little longer than the green square which will be the hat. Also, you will need to cut a long rectangular strip of black construction paper for the trim on the hat. This should be the same width as the green square hat. To make the buckle, use yellow, gold, or orange construction paper. Take a small scrap, and fold it in half and cut a rectangle. Along the fold, you can cut out the inside to make a hollow rectangle. Glue all the pieces in place, and then glue the hat to the plate. The next step is to make the eyes. I used three coins as templates for tracing, a quarter, penny, and a dime. I used the quarter to trace a circle in black, the penny to trace a circle in white, and the dime to trace a circle in blue. Then, you can use a hole punch to punch out a tiny circle in white for the center of the eye. All these circles then get glued on top of one another, biggest to smallest, to make the eyes. Then, glue the eyes to the paper plate. Now it is time to make his nose. I used a bit of pink construction paper scrap, and I used the hole in my scissors as a pattern to trace an oval. Or, be creative and try to find other things around the house that can act as tracing templates for a funny shaped nose. Then, glue the nose on below the eyes. I then used a marker and drew on the mouth. But you can use construction paper to make a mouth. A big grin would look great with some chunky teeth showing! Next it is time to make his beard. Take the red construction paper and start cutting thin long strips from it, about 1/4 inch wide. When you are done, take all these strips and cut them in half to make them shorter and so you have twice as many as you started with. 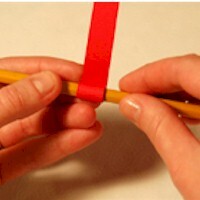 Take each strip and roll it tightly around a pencil. This will make it curly. Then glue each curly strip around the edge of the plate to make his beard. The paper plate leprechaun is all finished. It should hold up well just using some tape to hang to the door, or a loop of string can be taped to the back for easy hanging. This craft reprinted courtesy of Crafts-For-All-Seasons.com.